I think that you meant to enter http://localhost/. Thanks anyway, though. 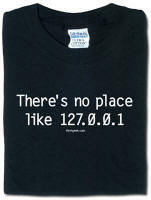 127.0.0.0/8 - This block is assigned for use as the Internet host loopback address. A datagram sent by a higher level protocol to an address anywhere within this block should loop back inside the host. This is ordinarily implemented using only 127.0.0.1/32 for loopback, but no addresses within this block should ever appear on any network anywhere [RFC1700, page 5]. For more information, see the "Localhost" page on WikiPedia. You can also visit http://www.markalanwade.com/, he's a really nice guy.